As I have for businesses and nonprofits, I have advised various professionals in the strategy and tactics of online branding through social media. As I have for nonprofits and the talk shows I have produced, I have also managed various e-mail campaigns, as through iContact and MailChimp, and deployed Facebook, Twitter, and other social media widgets in Web sites for professionals. In addition, I have implemented Google Analytics and Webmaster Tools, and consulted in SEO and employed best practices in the Web sites I have developed; and I have developed original RSS/XML feeds and XML Site Maps for my own sites. 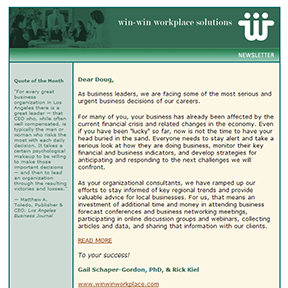 Most importantly, from 2005 through 2011, I edited and, through iContact.com, sent out e-newsletters from Win-Win Workplace Solutions to hundreds of CEOs, executive directors of nonprofits, and other influential clients and colleagues.